It took two years for Phish to release a follow-up to its masterpiece Billy Breathes. 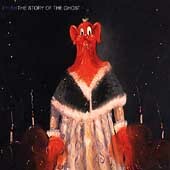 The group should have taken just a little more time to smooth out the rough edges to its latest release The Story of the Ghost. That's not to say that The Story of the Ghost doesn't have its moments because there are some jewels hidden under the dust. The band's songwriting remains strong, though lyrically it falls short of what it attained on Billy Breathes. Fortunately, Phish has always had a knack for infectious grooves, and this is definitely the strong point of The Story of the Ghost. Nearly all of the songs contained on the album are packed with mesmerizing melodies, and they come in a variety of styles. The group bounces through the bluegrass tune Water in the Sky, delivers stunningly beautiful Beach Boys-style harmonies on Brian and Robert, and slides through a rhythm and finds a blues groove on Ghost. The Moma Dance picks up where Ghost leaves off as Phish increases the pace, mutating the melody into a funky mantra. The Story of the Ghost is available from Barnes & Noble.